Drop App Review: Is Earn With Drop A Scam? Drop is a cool new app that pays you to make purchases at some of your favorite stores. This is another app that requires you to connect a credit or debit card, so this might not be for everyone. I’ve been using the app for a few weeks now it seems to be completely safe. The advantage of linking a card is you don’t have to worry about scanning receipts. 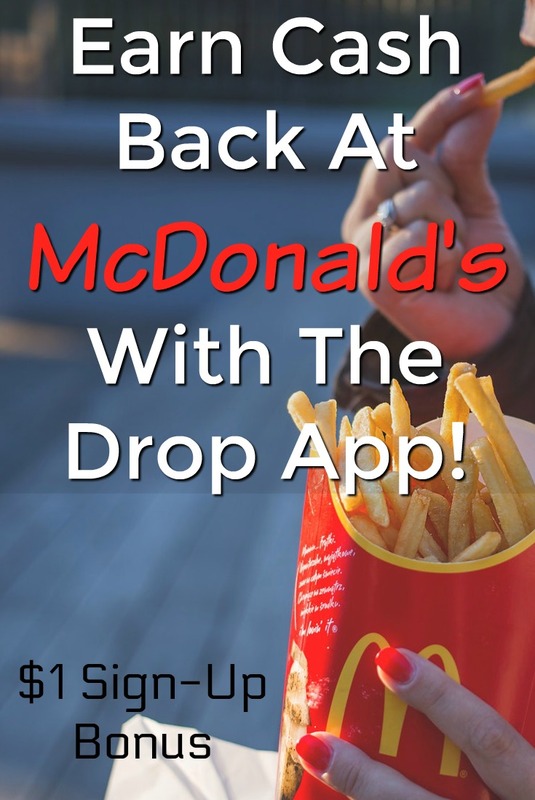 The Drop app automatically sees your purchase and applies points for your cash back accordingly. The Drop app is now officially available in the US and CA. Although the Drop app is legitimate please keep in mind it’s going to be a small extra income that requires you to spend money. If you’re interested in making a full-time income online, check out My #1 Recommendation, it’s how I made over $13,000 online last month! In this Drop app review, I’ll cover how it works, the rewards available, and see if it’s legitimate or a scam. In this Drop app review, I marked it legitimate, and I plan on using this app myself. It’s pretty much free money when you make purchases at the participating retailers, which I frequently do. I don’t have many complaints about the app, but I completely understand if you have an issue linking your card. It seems to be safe, but if it’s something you’re not comfortable with I recommend skipping this opportunity and trying one of these apps. Overall, as long as you’re comfortable and make purchases at these retailers I recommend using the Drop app. The first step is to sign up for a free account by visiting EarnWithDrop.com. When you sign up, you’ll earn a $1 sign-up bonus. The next step is to link a card. You’ll earn 500 points for linking your first card and 2,000 for linking a second. Drop works with most banks, and you link your card by logging into your bank through the app. More offers are being added continuously. Although you can only select five ongoing offers when joining, it seems you can add the new ones without dropping any of the old offers. You’ll also see limited time offers inside the app. These seem to be more like offers on a rewards site, where you join a service and earn points up front but don’t earn for every purchase. Once your card is linked, and you have the offers you’d like all you need to do is shop. Once you make a purchase at a participating store, Drop will notice the transaction and pay you points for how much you spent! Within the FAQs, it says you should receive your points within five days of your purchase. I think I’ve seen a range from 3-4 days to see points show up. An easy way to earn more is by completing bonuses. You’ll naturally complete these as you use the app. For example, you’ll earn points when you link your first two cards, follow them on social media, complete your profile, refer five friends, and more. Most of these bonuses pay 30-2,000 points. If you’d like to earn more without spending more the best way to do so is by referring friends. Drop gives you a custom link and referral code you can share with friends. When they sign up and link a card, you’ll earn 1,000 points (equal to $1). The Drop app has several gift card reward options ranging from $5-$100. I’ll cover the rewards in more detail in the next section. Their FAQs state that once you redeem a reward, you should receive it within 24 hours via email. I recently earned enough to cash out a $5 reward. 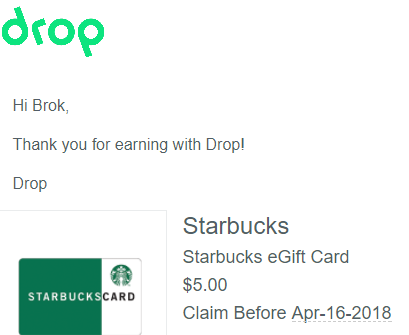 Below is an email I received from Drop that included a $5 Starbucks gift card. It took less than a minute to arrive in my inbox once I cashed out inside the app! The only way you wouldn’t want to use this app is if you’re afraid of issues with your card once you connect it to the app. Most people will be comfortable with it, but if not I recommend just skipping this app, it’s not worth it if you’re not comfortable with the process. I will say that I’ve linked a Discover and a Visa card and have had some issues with the Discover card staying connected. With that being said there’re not many complaints about that in reviews, so the card linking seems to work pretty well. This comes down to personal preference, but I’d rather get paid in cash than gift cards. At this time there’s no cash reward option. Hopefully, they will eventually expand to offering payments via PayPal or Venmo. 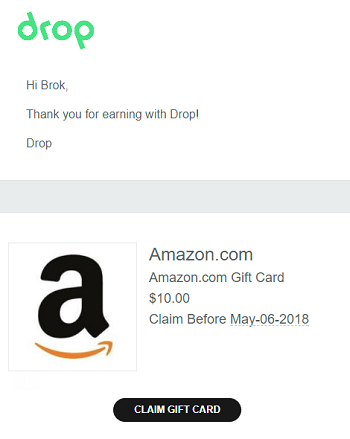 Is Drop App A Scam? The Drop app is not a scam, and it’s actually a very popular app in Canada at this time. They just recently opened it up to the United States so I feel like they’ll continue to grow and add more retailers and rewards. As long as you’re comfortable linking a debit/credit card I recommend using the Drop app. As mentioned, I’ve been using this app and plan on continuing to. If you’d like to learn more or to join, visit EarnWithDrop.com to earn a $1 sign-up bonus! Do you have experience with the Drop app? I’d love to hear your thoughts on this app in the comments section below!